I knew full well that had I presented her with the problem 3 ÷ 1/2, she likely would have looked at me like I had two heads. By solving the problem in the pursuit of an actual task (especially one that had the promise of something delicious at the end) she was able to arrive at the answer “Six” with complete understanding. To Zoe it was quite clear that the problem she needed to solve was “How many ½ cups of sugar are in three cups of sugar?” or, to put it symbolically, 3 ÷ 1/2 = ? The fact that her answer (or the quotient) six, was greater than both 3 and 1/2 (the dividend and divisor, respectively) didn’t faze her one bit. She knew that for every cup of flour, she would need to use two of the 1/2 cups, thus leading to her final answer of six. I’ve suggested before that measurement is the perfect context for exploring fraction relationships, fraction equivalency, and fraction computation. * This is especially true with measurements that can be represented on a number line, such as those involving time and distance. 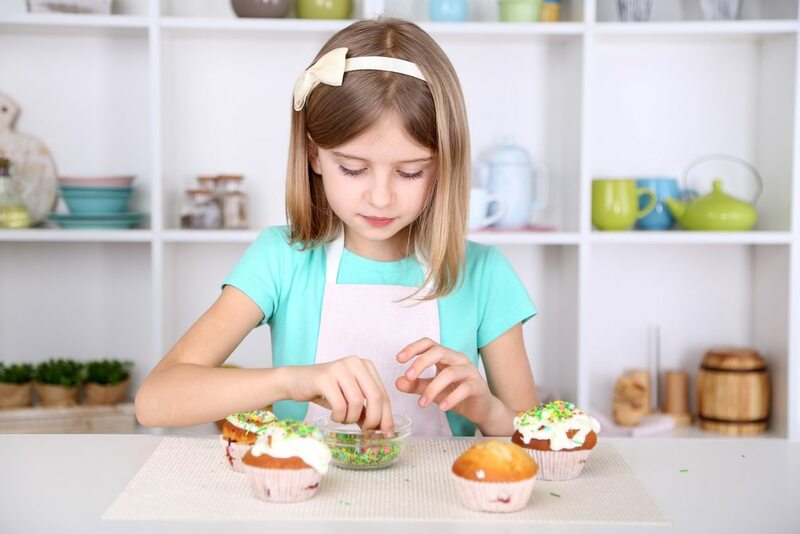 Measurements used within the context of cooking and baking are also appropriate for developing an understanding of fractions, since ingredients are often measured in fractional quantities. Take the following problem, for example. 2 1/4 ÷ 3/4. My chocolate chip cookie recipe calls for 2 1/4 cups of flour and 3/(4 ) cup of both brown sugar and granulated sugar. After I’ve added the two types of sugar to my batter, I then use the 3/(4 ) cup measuring cup to add the flour. ** How many 3/(4 ) cups of flour do I need to make 2 1/4 cups? In other words, how many 3/(4 )s are in 2 1/4? The two examples I’ve shared both could be used to address division (2 1/4 ÷ 3/4), addition (3/4+3/4+ 3/4), subtraction, (2 1/4 – 3/4 – 3/4- 3/4), and multiplication ( 3/4 x 3). My strategy of using the 3/(4 ) cup measuring cup is only possible because my measuring cup set comes with a 3/4 cup measuring cup. What if it didn’t? How would I then measure the correct amount of sugar (3/4 cup) and flour (2 1/4 cups)? I’ll leave you with that, and encourage you to come up with other problems that can be explored through measurement. *See Chapter 3 in Beyond Pizzas & Pies: 10 Essential Strategies for Supporting Fraction Sense, 2015, Math Solutions. **True story – I do this every time I make chocolate chip cookies!